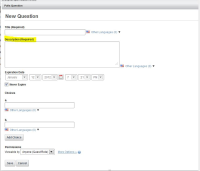 Change the title of "Description" text area to "Polls Question"
Tomcat 7.0 + MySQL 5. 6.1.x Revision: 95322. Currently, when the user creates a polls question, he enters the actual question in the "Description (required)" text area. The title of the poll is not used towards the actual question. This does not sound very user friendly and should be changed to something else. Perhaps it should also be changed from a large text area to a smaller text field since the question being asked does not have to be very long.